As aviation and maritime safety has increased, one doesn’t hear so much about the Bermuda Triangle so much anymore. Known as the “Devil’s Triangle”, it wasn’t so long ago that it was considered the biggest mystery of the time. The first reference to this mysterious and dangerous area which appeared to be swallowing ships and aircraft whole, was made in an article by Edward Van Winkle Jones, a Miami Associated Press Writer. Sea’s Puzzles Still Baffle Men In Pushbutton Age was published in 1950. In 1964, the Bermuda Triangle was delineated by Florida, Puerto Rico and Bermuda. The aircraft that caught my eye is the one on the bottom of the original map, a passenger flight along the bottom of the triangle. I was thrilled to discover that the original accident report is online and available at Online Digital Special Collections of interest to Department of Transportation. Airborne Transport offered a scheduled passenger service between Miami, Florida and San Juan, Puerto Rico. The aircraft was a Douglas DC-3, registration NC-16002, and was leased to Airborne Transport, Inc. It had just been through an inspection a few days earlier and the CAA Designated Aircraft Maintenance Inspector found it to be airworthy. A line inspection report on the 27th of December noted that a generator voltage regulator was changed. The maintenance records were not complete, however. The Superintendent of Maintenance stated that new batteries had been installed in the aircraft recently, but there was no record of this installation. A San Juan repair agency reported that they’d done repair work on a malfunctioning engine in October of the same year, but there was no evidence that the work was ever completed. On the 27th of December, the DC-3 flew from Miami to San Juan and landed normally at 19:40 EST after some difficulties with the landing gear. The Captain reportedly commented that “the landing gear was not locked”. He contacted a repair agency on site and asked them to examine the aircraft batteries, which were found to be discharged with the water level low. It would take several hours to recharge the batteries, delaying the next passenger flight from San Juan to Miami. The Captain asked the mechanic to add water and return the batteries to the aircraft without charging. The landing gear warning light system was reported as malfunctioning but not repaired. The Captain had flown the route before as co-pilot but this was his first trip as Captain for Airborne Transport. However, he had previous experience on the route flying for other companies as well as military flying experience in the area. The flight crew filed an IFR flight plan at 20:30 for the flight back to Miami and the Captain stated at that time that the aircraft was in good working order. One cabin crew member and 29 passengers were brought on board ready for the flight. The decision to carry on without recharging the batteries is an odd one. After the seven-hour flight from Miami, the batteries should have been fully charged. It seems fairly obvious that as the batteries were found “in a discharged condition” when the flight arrived in San Juan, they were unlikely to begin charging again for the flight back. Despite this, there doesn’t appear to have been any attempt to look into it further. There’s no record of any examination of the electrical system, landing gear or the faulty warning lights. An hour after they filed the flight plan, the Flight Information Clerk was advised that the flight would be delayed because of battery trouble. The delay meant that the flight plan was invalid and a new flight plan should have been filed. At 22:45 the DC-3 taxied to the end of Runway 27. There, the aircraft stopped as they were unable to transmit. When the tower realised they were unable to contact the aircraft by radio, they contacted the Puerto Rican Transportation Authority and the Chief of Aviation went out to the aircraft. The Captain told him that the aircraft’s radio receiver was functioning properly but that the weak batteries meant that the transmitter was not working: they could hear the radio calls but they could not respond. The Chief of Aviation related the information to the tower using his emergency car radio. He verbally cleared the crew for visual flight but under the specific proviso that they stay in the local area until they could contact the tower. He said that they agreed that the flight would remain nearby until the generators produced enough power for radio transmission. Once the aircraft had power, the flight crew could file a new IFR plan and proceed to Miami. Both the Chief and the flight crew believed that once the aircraft was in flight, the generators would produce sufficient current to allow transmission. The DC-3 departed at 23:03. At 23:14, the flight crew attempted to contact the airport control tower, but the tower did not receive the call. The transmission was heard by CAA Communications who responded. The flight crew reported that they were unable to contact the tower and that they were proceeding to Miami on an IFR flight plan. The flight had only been approved for local area until they were able to transmit to the tower; however the flight crew simply continued on course. The original IFR flight plan had been cancelled when the departure time was delayed but the flight crew never filed another; they appeared to believe the old flight plan could be reinstated. This conversation was the last two-way communication established with the flight. Neither San Juan tower nor CAA Communications were able to contact the aircraft again. 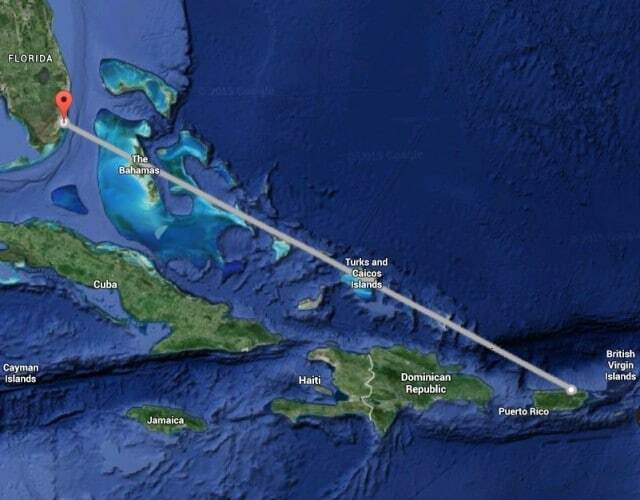 At 23:32, the Overseas Foreign Air Route Traffic Control Center, based at Miami, Floria, received a transmission from the flight crew that they were flying at 8,500 feet and estimated that they would fly over South Caicos at 00:33 and arrive at Miami at 04:05. At this stage, presuming the position report was correct, they were 700 miles (1,100 km) from Miami. The weather conditions that night were scattered clouds at 2,500 feet with visibility 12 miles. The DC-3 had planned to cruise at 8,500 feet, above the scattered clouds and with light variable winds. By the time they reached South Caicos Island, the clouds would have increased and extended up to and over the cruising level. By the time the aircraft was approaching Nassau and Miami, the clouds would have been scattered again and the flight would again have been cruising over them. The wind was forecast from the northwest but changed direction to the northeast. As this change was enough to blow the aircraft off course, Miami Traffic Control broadcast the information at 00:15. They never received any acknowledgement from the flight crew and it is not known whether they received the information. At 04:13, a controller at New Orleans Overseas Foreign Air Route Traffic Control Center intercepted a routine position report from the aircraft: they were 50 miles (80 km) south of Miami. The controller relayed the information to the Miami Traffic Control Center who had not heard the transmission. This was the last contact with the flight. Air traffic controllers in San Juan, Miami and New Orleans tried repeatedly to contact the flight but were never able to get through. From this, we know that the aircraft’s transmitter was operating and and that the flight crew believed they were on course at 04:13, six hours and ten minutes after take-off. However, we don’t know if the position report was correct. They had fuel for 7 1/2 hours of flight. The change in wind direction as the flight neared Miami was such that if the flight crew were not aware of it and working from the original forecast, they could have drifted to the left of their course by 40-50 miles (65-80 km). At 08:30, the Civil Aeronautics Board at Miami was contacted to report that the aircraft was considerably overdue on a flight from San Juan, Puerto Rico to Miami, Florida. The United States Coast Guard was alerted and an extensive search begun. Among those participating in the search were the U. S. Coast Guard, the U. S. Navy, the Fifth Rescue Squadron of the U. S. Air Forces and numerous civil aircraft. Also actively engaged in the search were agencies of the Government of Nassau, the Dominican Republic and the Cuban Government. The search covered an area from San Juan, Puerto Rico, to Cape San Blas in Florida, the peninsula of Florida and the southern coastal area of the United States to Cape Romain, which is located approximately 45 miles north of Charleston, South Carolina. The Gulf of Mexico adjacent to the coast of Florida, the island of Cuba, the north coast of Hispaniola and the Bahama Islands were also searched. 2 Over 1,300 plane hours were flown during the six days of search, from December 28, 1948, to January 3, 1940 in conjunction with the air search, a detachment from the Fifth Rescue Squadron, U. S. Air Forces, conducted a through investigation and ground search of portions of the north coast of Cuba. The terrain was both mountainous and jungle, making the search difficult. The weight and balance records submitted by the flight crew showed that the aircraft had departed with 650 gallons of fuel. Based on this submission and the passenger manifest, the aircraft was 118 pounds (54 kg) overweight when it departed San Juan. The search was given up six days later without finding any trace of the missing aircraft or its 32 occupants. The investigation report was released six months later, in July 1949. As no wreckage had been found, no probable cause was determined. The aircraft is one of a dozen “mysterious” aircraft incidents linked to disappearances at the Bermuda Triangle. Reading the accident report, however, it seems pretty clear that it is another case of the holes in the swiss cheese lining up. The Captain simply took one shortcut too many. My compliments for the professional way you tell this story. The so-called “Bermuda Triangle” is a lot of bunkum, invented by people who could milk it for a few stories and books. You do not fall into the trap of this “triangle” nonsense but keep it objective. The main reason for this myth is that it is an area of high activity, both at sea and in the air. Weather can be tricky, especially in the past when the forecasters did not have the array of technical wizardly they have to-day. Navigation was often by compass, dead reckoning and a few beacons. Or the old-fashioned sextant. It is a near certainty that quite a few disappearances ascribed to this “triangle” were actually lost outside the area. Which brings the average number of disappearances down to the average, anywhere. Nowadays, an aircraft is by law required to have emergency battery power for a minimum of 30 minutes. Perhaps not then, but even so, deciding to accept an aircraft for a flight under IFR with a defective battery and other defects that would have seemed to nearly shout the message: “there is more wrong than just a dead battery” is unprofessional in the extreme. The operator of the DC3 that features in your article behaved unprofessionally beyond belief. So did the mechanics. The operator, Airborne Transport, must have been a sloppy operator, even by the less stringent regulations of the time, judging by your article. The captain? If he were alive to-day I would not trust him with my old, worn-out shoes. I never heard of any airline that promotes a co-pilot, regardless of his or her previous experience without a proper company check-out. The decisions this pilot made, on his first flight as captain for this company, violate many rules regarding basic safety. I can go on, but it can probably all be summed up as “Cowboy Operation”. So it is abundantly clear that the fate of this flight had nothing whatsoever to do with this “Bermuda Triangle”. The captain had set himself up for disaster from the moment he decided to take-off with serious unidentified and not rectified defects. The malfunctioning battery may well have had an internal short and could have led to overheating of electrical components. That, in turn, may have led to a loss of all radio navigation equipment, it could even have caused an on-board fire. I believe that my grandmother was a passenger on the 12/28/48 flight that disappeared, but I haven’t been able to locate an official passenger manifest to confirm it. Anyone happen to know where I might be able to look? I’m afraid I don’t know; there was no docketing system at the time, which is where one would normally look. I’d start with the library to see if you can get access to newspaper reports at the time, they may well have published the passenger names.